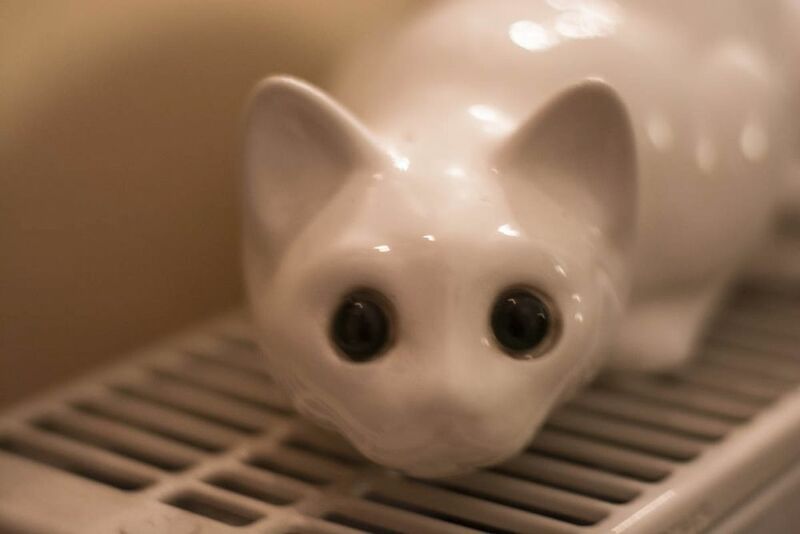 My grandma has this beautiful porcelain cat lying on her heater. I remember my mother had similar porcelain cats in the past. I’d like to have one of these too as decoration for my living room, but as I have a real cat this would probably not remain as one piece forever (laugh). But a white porcelain cat wouldn’t fit to the colors of my furniture anyway because my cupboards are mainly in walnut or to be more exact in mahogany color. It would need to be porcelain cat with darker color. That posture is too much! We have a real, live white cat and that captures her beautifully. Any idea where to get one? I am not sure where my grandma got this one from, but I believe she said once that it was a local store that sold it a long time ago. It might be that I visit her the next days and I could ask her where to get these, or if it’s still possible to find the same. I asked grandma and she said white porcelain cats were trendy in Germany several years ago, and you don’t find them in local stores anymore. She said she owns this one since almost a decade and doesn’t even know anymore where she got it from, but it was a local store. A quick Google search reveals that you can find other pictures of white porcelain cats but sadly not where you can get them 😦 So, I fear it’s maybe not easy to get one unless you research. The day I stopped having cats, I finally got a bit of porcelain back in my life. There was a time in my life that everything I owned was wood, plastic, or metal. Everything else had been broken. Porcelain and china cats were very popular some years ago and my mun had a tabby one, I think my sister may have it now. I have a couple of black cats as bookends but you are right this kind of ornament needs to be kept out of reach of pets. Polly does not jump on things that much but a previous cat destroyed a shelf full of china and glassware by jumping onto a bookshelf where they were displayed. Yeah, with cats always something can break, either because they want it to break, or not with intention as in your case. Cats do find knocking things down enteraining. Polly likes to knock pens and other small items off my desk.